As far as is known, Rouennais has only ever been produced as a sheet of etched court cards and aces. Only three proof sheets have been taken (possibly), one of which was coloured and intended for submission to the Royal Academy open exhibition. However, the entry date was missed and the sheet was sold. 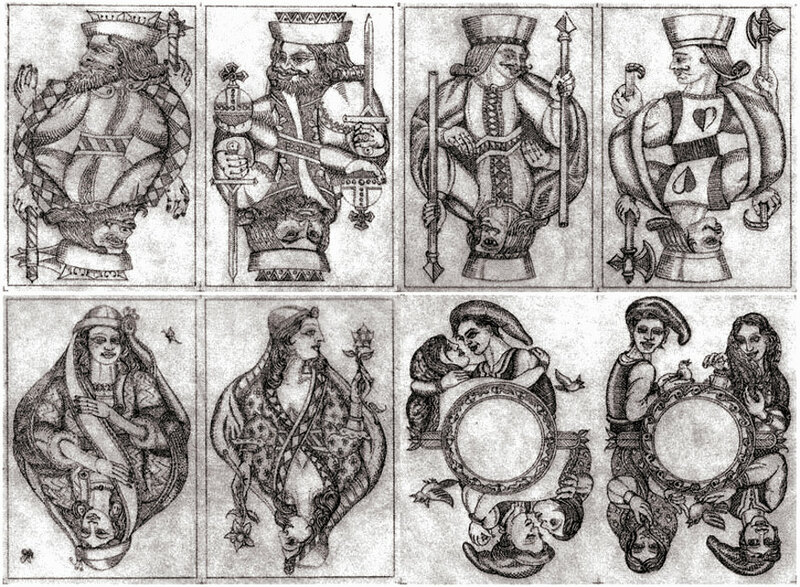 The designs are supposed to be based on the early playing cards produced in Rouen (France) which became the antecedents of the standard English pattern. The pictorial Aces, of course, are Karl's own design. Here and there we can recognise motifs and ideas which are developed more fully in some of Karl's other packs. Above: uncoloured proof sheet of Karl Gerich's Rouennais playing cards No.14, which was never completed. Images courtesy Barney Townshend. ♣ Tregear, Mike and Daphne, "Karl Gerich: Card Designer and Maker", privately published. Copyright for all images remains the property of the Artist.